A selection of patriotic British classical music, from some of the nation's best composers, performed by Classic BRITs-nominated performers, the Band of the Coldstream Guards. The brassy charm of Handel's jubilant anthem is expertly handled by the Coldstream Guards and choir. It's performed at every British coronation, and has been since 1727. Unlike the treble version performed at the London 2012 Opening Ceremony, this beefy rendition features British tenor Alfie Boe alongside the Coldstream Guards. Military drums, a marching band, fluttering flutes, and a catchy tune - it can only be the wonderful British Grenadiers. The drum beat slows down in the middle for a truly regal brass fanfare. After hearing the glorious pomp of Elgar's music arranged for military band, complete with choral singing from the Fron Male Voice Choir, you might never want to listen to the orchestral version again! The rousing classic from this stellar British composer is perfect for the brassy Band of the Coldstream Guards. Some pieces are better suited to brass instruments, and the mellow strains of the beautiful Welsh hymn prove the point. The gradual build-up to the end carris a deep strength of feeling - relevant to the religious and non-religious alike. Cheeky and quintessentially British, this quirky medley of well-known radio favourites from the past are given a military spin. 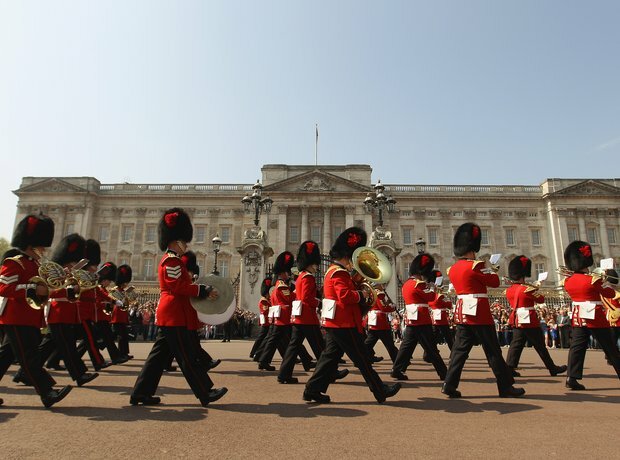 How would the Classic FM jingle sound when played by the Band of the Coldstream Guards, we wonder? British composer Ron Goodwin is known for his film music. His music from the 1966 film 'The Trap' is now used as the theme tune for the London Marathon. Another film music moment from British composer John Addison. The brassy fanfare is used in the 1977 film, 'A Bridge Too Far', a British war film. A lively celebratory piece from adopted Brit, Handel, given appropriate military treatment by the brilliant Band of the Coldstream Guards. The pomp of the tubas, upbeat drums, and bright trumpets make this an arrangement fit for a Queen. What's your favourite piece of British music? If you haven't already heard it on the album, you're bound to hear a snippet in this whistle-stop tour of some splendid tunes - see how many you can pick out! 'Thine Be the Glory' and 'Rule Britannia', can only be improved by adding a drumroll and a chorus of tubas. The harmonies are pretty exciting too! If you thought Nimrod was tear-jerking when played by a string orchestra, the Band of the Coldstream Guards' brass version is sure to provoke an emotional response. It's testament to the fact that military music doesn't have to have a steady drum beat - the soothing cornets are spine-tingling. Holst's tune pulls at the heart-strings as it is, but the Band of the Coldstream Guards' version is stately and thought-provoking - a fine piece to honour our troops. A perfect finish for this album of the best British music, in a particularly patriotic year. The Diamond Jubilee and the London 2012 Games have turned British cynicism on its head and created a legacy of which we can be proud.